I don’t officially vote in any of the FCS Top 25 polls, but I do share who I think deserves to be in the Top 25. And my No. 1 and No. 2, James Madison and North Dakota State, amply proved their worth again in tough conference matchups where they ended up victorious. It wasn’t as easy as the 30-8 final score might indicate, but James Madison finally solved the Villanova defense in the fourth quarter just when the Wildcats were threatening to tie the game. 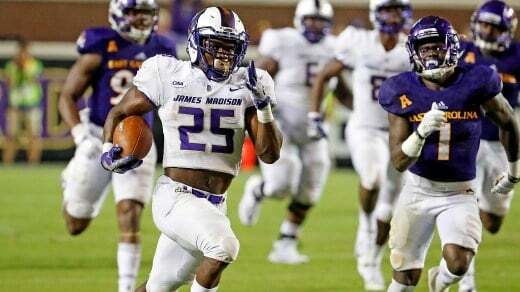 The Dukes’ remarkable winning streak just keeps rolling along – since losing to Colgate in the FCS playoffs in 2015, defending FCS National Champions James Madison has gone 20-1, their only loss coming to a North Carolina team last year that played in a bowl game. North Dakota State’s 27-24 win, however, against the runner-up in last years’ FCS Championship game, Youngstown State, was a prizefight won in overtime when PK Cam Pedersen booted a 36 yard field goal to beat Bo Pelini’s Penguins’ on the road at the Ice Castle, Stambaugh Stadium. Since November of 2015, Youngstown State has lost exactly two home games – both of them, now, to North Dakota State. I don’t officially vote in any of the FCS Top 25 polls, but I do share who I think deserves to be in the Top 25, and this week, unsurprisingly, I think James Madison was, and still is, the No. 1 team in the nation. Not exactly going out on a limb, am I? 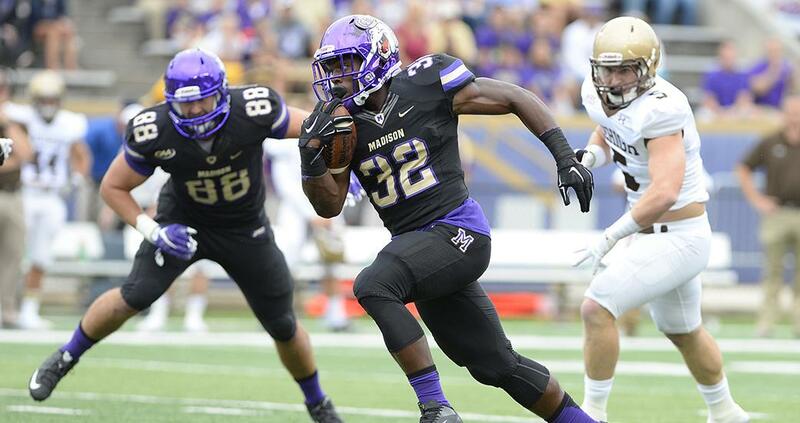 If you try to pick FCS games, one of the easiest picks of last week was to take the Dukes to upset the Pirates. Pretty much all the experts across the board thought that James Madison, even with some suspended players, was stacked enough to take over rebuilding East Carolina, and boy, did they ever. Remember the days when FCS vs. FBS matchups were defined by the FCS teams “wilting” in the fourth quarter? With upper-echelon FCS teams like James Madison, that myth has been debunked for a while, but it was brutally apparent in this game, when RB Cardon Johnson easily eluded East Carolina tacklers on two 80+ yard touchdown runs. That didn’t surprise me at all this weekend. And they’re still my No. 1 team. 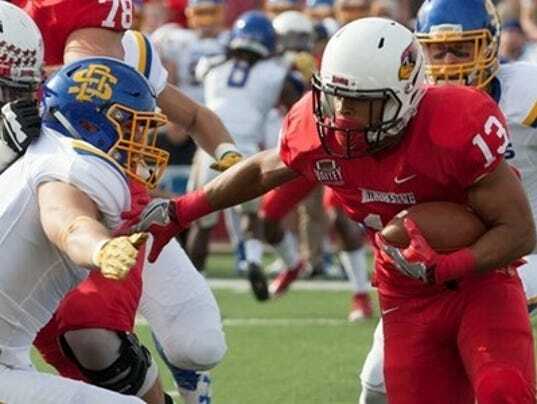 You didn’t ask for them, but here’s my pick for this week’s FCS Top 25. I’m pretty proud of myself for not falling into the trap of South Dakota State. Many people, after the Jackrabbits’ huge win over North Dakota State, vaulted them to the Top 5 of their polls, but I know better. The craziness of the Missouri Valley I thought would eventually catch up with them, so I had only reluctantly put them at No. 10. Their loss to 3-5 Illinois State, taken in isolation, was a shocker – but perhaps not completely shocking, though, considering the Missouri Valley has not one but two teams that have beaten Power Five Teams and also have five losses. In fact, there are three Missouri Valley teams – Illinois State, South Dakota and Northern Iowa – that can plausibly say, if they get to 6-5, they have a legitimate shot at making the playoffs as an at-large team, thanks to perceived quality wins. I love picking games correctly involving teams 1-13 because it makes picking the Top 25 very easy – simply cut, and paste. Most of that comes from not overrating teams like Northern Iowa, who dropped out of my top 25 after a bad loss to South Dakota, and properly rating Villanova, who keeps winning and has been a regular in my Top 10 for several weeks now. One of the teams I had been considering for the Top 25 is Dartmouth, but after a stunning 21-13 loss to Yale, I’ve had to re-evaluate that assessment. If you’d like, you can check out my FCS Top 25 vote below. The Big Green and Harvard, whom I’ve had in my Top 25 all season, played a game last Friday that was as great as a game between Top 25 teams can be. For 3 1/2 quarters, Dartmouth controlled the game, up 13-0 and the Big Green’s defense, somewhat surprisingly, completely smothering Harvard’s potent offense. Then, in the span of about six and a half, Harvard, amazingly, pulled out the win. One touchdown pass to WR Seitu Smith, one Dartmouth fumble and another touchdown throw from QB Scott Hosch to RB Justice Shelton-Mosley, and Harvard took their first lead of the game with 36 seconds left in the game. It was a great game to watch, and amply showed that both teams were worthy of Top 25 status, but it is impossible, as a neutral fan, to not feel for the Big Green, who had them right there. The story of the week in James Madison after their loss to Richmond wasn’t the fact that College Football Gameday was there, nor was it about their big CAA conference loss, which took them out of the drivers’ seat for the CAA title and conference autobid. It was the fact that their superstar quarterback, QB Vad Lee, sustained an injury that would require surgery and take him out for the remained of the season. The play didn’t look like much. The Dukes, who were already down by two touchdowns, saw Lee simply try to make something happen on a routine 2 yard run left. A shoestring tackle by Richmond’s linebacker wasn’t particularly dirty, though in retrospect it looked like his foot was tackled awkwardly. A play afterwards, Lee remained in, and collapsed after hucking a deep pass, and his incredible career at JMU was done. Last week, I said people around the country are starting to understand that James Madison is a pretty damn good FCS football team. Apparently, someone at College Football Gameday was also paying attention to the Dukes as well. 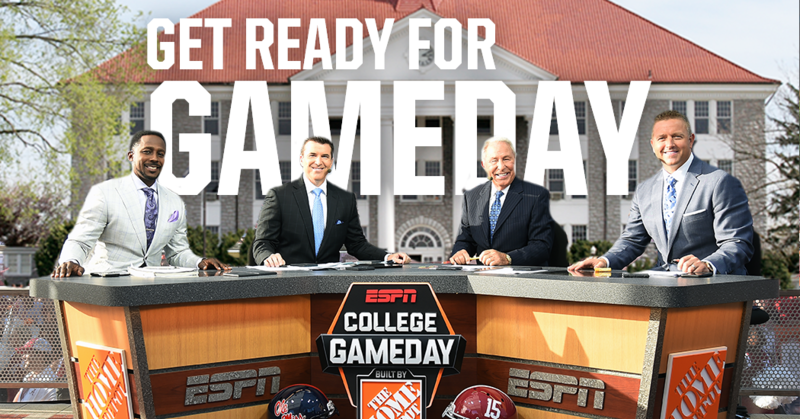 At 7-0, James Madison University was chosen as the site for ESPN’s pregame show College Football Gameday, to highlight their game versus another Top 25 school, Richmond. It’s not the first time College Football Gameday has elected to cover an FCS school. The nationwide program has already made a couple stops in Fargo, North Dakota to cover the North Dakota State Bison, and last year the hot rumor was that Gameday was going to cover Lehigh vs. Lafayette‘s 150th celebration at Yankee Stadium, but ultimately decided to go with Harvard vs. Yale, as “The Game” was for an Ivy League championship and “The Rivalry” ended up being for pride. Harrisonburg, Virginia I’m sure will be a great host for Gameday. It’s also worth mentioning Dukes fans, and possibly their athletics reps, will be doing a great job showcasing Bridgeforth Stadium and their “FBS-ready” program. Already some have taken to the papers to talk a little about an FBS move. And why not? I don’t blame them. As much as I like the Dukes in FCS, I can very much see their team end up in the FBS eventually, ideally as a travel partner/rival to Old Dominion in Conference USA. People around the country are starting to understand that James Madison is a pretty damn good FCS football team. At 6-0, they bear little resemblance to the team that squeaked by 3-8 Lehigh last season. The lowest offensive point total they put together in a game was 38 – versus Stony Brook, who could be a playoff team. QB Vad Lee is firing on all cylinders, just showed up in Sports Illustrated’s Faces in the Crowd, and the Dukes faithful may be getting a look from College Football Gameday in a few weeks. After they made mincemeat of Lehigh in Week 2, I knew they were good. But I didn’t really know how good until they got into the league portion of the schedule. They pounded Towson 51-30 last weekend, and they will in all likelihood go 7-0 after their trip to 2-4 Elon this weekend. I’ve had them at No. 1 the past three weeks or so, and they’ve amply justified my pick.